The hibiscus plant, with its lush green leaves and large, billowy flowers, is reminiscent of balmy nights and tropical locales. Originating in Asia and the Pacific Islands, it is a member of the Malvaceae or mallow family. Aside from its use as an ornamental, hibiscus have been used to make dyes and food. The hibiscus comes in a wide variety of eye-catching colors. All combinations of pink, red, purple and yellow are found in this species. The size of the flower ranges from 2 inches to 10 to 12 inches in diameter. Plants vary in growth. Some cultivars grow slowly, averaging 2 feet in a number of years, while others grow up to 15 feet. 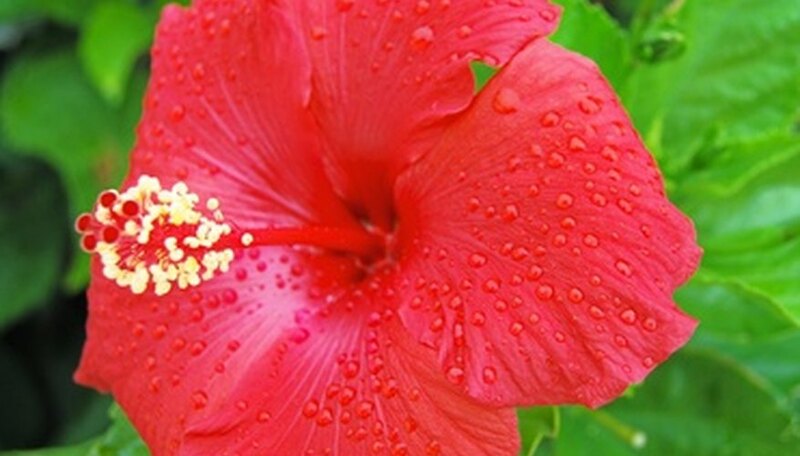 Hibiscus plants require moist but not overly wet soil that drains well. Sandy, rich soil with a pH of 6 to 7 is ideal. Organic matter in the soil and mulching will keep moisture levels even. This plant does well when provided a lot of direct light, but will reduce blooms when confronted with heat over 90 degrees F for extended periods. Hibiscus is a tropical plant that does not survive freeze. For those who live in colder climates, hibiscus may be grown in a pot and moved indoors when temperatures dip. In areas where freezing temperatures are more moderate or of a shorter duration, frost damage can be prevented by covering the plant to retain heat. The hibiscus is a heavy feeder that prefers frequent but light fertilizing. A nitrogen fertilizer in the spring and a high potassium fertilizer in the summer work well for the hibiscus plant. Also, fertilizing at the beginning and during the growing season gives the hibiscus needed nutrients for growth. A 10-10-10 dry fertilizer will suffice; however, a low-phosphate fertilizer, such as 7-2-7, is considered by growers to be superior in providing quantity as well as quality of blooms. Water-soluble fertilizers high in phosphorus are beneficial as foliar sprays. Other nutrients such as iron, copper and manganese should be included in the fertilizer. Be wary of excess nitrogen, which will promote leaf growth at the expense of blooms. Using 10-40-10 type formulas can cause a buildup of phosphorus in the soil which eventually results in a general decline in the plant. A water-soluble 20-10-20 fertilizer is a suitable choice for potted plants. The hibiscus plant does well with timed-release fertilizers. Improper pH and irrigation methods can impede nutrient uptake. Yellowing of leaves, lack of blooms and general lack of vigor can point to a nutrient imbalance. Hard water and proximity to cement encourage an alkaline soil that prevents proper growth. A higher nitrogen fertilizer will give the hibiscus a boost after winter.